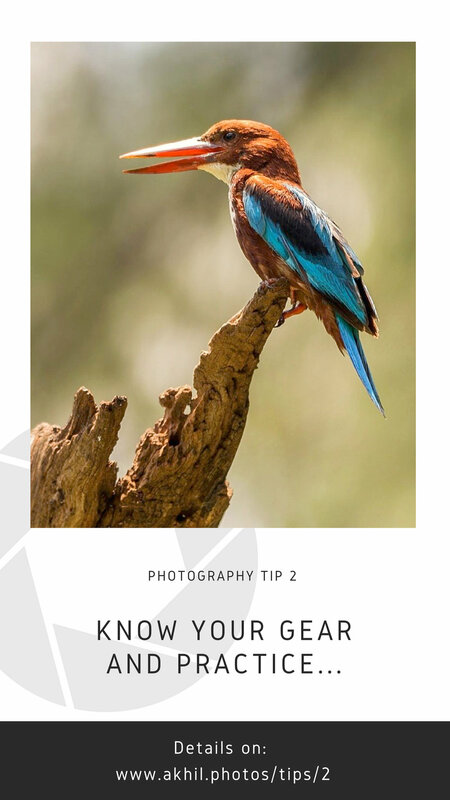 This White-throated Kingfisher image was shot many years ago when I was just starting wildlife photography with a 70-300mm lens and 500D body. The image was shot at noon and hence the bright patch of light on the beak. When one of my images get popular on social media, one of the questions I am asked more than often over comments is "what gear was used to capture the image?". Being able to afford or having expensive gear is definitely useful when it comes to capturing images more easily and perhaps with better results in difficult lighting and scene situations. But I strongly agree in the quote "the best camera is the one you have with you" and I am not saying that just for the heck of it. Camera or even a camera phone, after-all is a tool and the "person behind the camera" can make a big difference. The fact that great and really moving wildlife pictures were captured in the past too, when the equipment was not as advanced as of today, goes to prove this point. Currently, I am using the top-of-the-range gear from Nikon and I try to tap the maximum potential from it but I have to point out strongly that I started with basic gear too. My very first camera was a Canon 500d which in those days could be regarded as an entry-level prosumer grade DSLR camera and my go-to lens for wildlife was the Canon EF 70-300mm f/4-5.6 IS USM Lens which is a kit lens. It was best to shoot golden hour shots in the mornings after one hour from sunrise and one hour before sunset for best golden hour shots. Any earlier in the morning or later in the evening, the low light performance was bad and noise crept in. So I would urge all the photographers to try and understand the limitations of your gear through practice and work around to create beautiful images rather than blaming the equipment you have. "Sometimes the journey of learning/practice is more exciting than the destination of images". Please feel free to use the comment section below for any additional questions or feedback.